Calling, rather than betting or raising all-in yourself, only gives you one way to win: by holding the best hand. Betting or raising gives you two ways to win: by holding the best hand or by getting your opponent to fold. Which sounds much better, don’t you think? 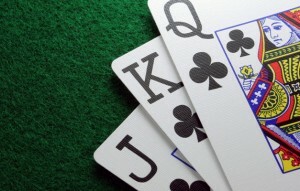 Imagine you have pocket sevens – or even your pocket deuces – and you find yourself up against two cards like A-K or J-10. You’re the favourite to win, but only by small margin. However there is one occasion when the odds favour your pair. Owning Q-Q and being up against A-K, puts you in the single most favourable ‘pair vs overcards’ situation. At 4:3, or 1.33-1, or a 57.2%, however you label it, you’re quite far away from coin flip territory. This edge is down to the power of your queens. They significantly reduce the A-K’s chances of winning with a straight as a queen will need to hit the board to make it possible. And with two of them tucked safely away you’ll be in the driving seat for sure. These hands stand a reasonable chance of winning a 1 on 1 confrontation against overcards, but they have several major vulnerabilities. If three or more players see the flop, you’ll usually need to make a set to win and these pairs are the most vulnerable to counterfeiting. Most of the time these hands play like small pairs. On the plus side they aren’t as vulnerable to counterfeiting and sometimes you’ll only be up against one overcard rather than two. However, these hands are often more troublesome than small pairs and as a general rule, unless you flop a set or a good straight draw (that is, the board is 4-5-6 and you have 7-7), you should get out, quick. Danger pairs play a lot like middle pairs, but will occasionally hold their own against an opponent who has hit part of his hand (like someone playing A-8 suited who hits the 8). Play them like you would middle pairs, you’ll very rarely get counterfeited but try not to push them too hard. You’ll only end up disappointed. The single trickiest hand in no-limit. It looks good because it’s a face card, but it’s vulnerable to lots of other hands. Only play it hard in favourable post-flop situations and don’t try to take on the world with it pre-flop. The third best starting hand in Hold’em. And we recommend you play it aggressively. Lead out with a significant raise, then sit back and wait to see if the flop contains an ace or king before making your next move. ‘Cowboys’ are a strong hand but they still rank below aces, because even a rookie playing A-3 has a 30% chance to beat you. So be careful when they land in your lap because nobody wants to lose like that. ‘Pocket rockets’ are great because you’ll never be facing an overcard. But like all the danger cards we’ve talked about you still need to know when to get away from them. Most importantly, whatever you do, don’t slow play this hand. You’ll get caught out if someone else at the table hits a stronger hand and you’ve let them in cheaply. If there was ever a hand to show who’s boss, this is it.